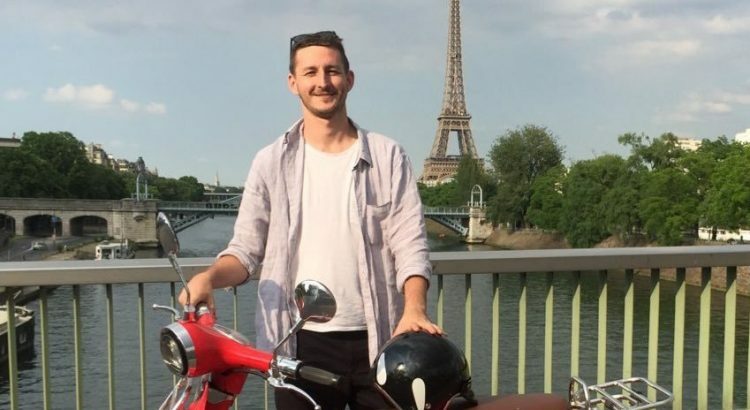 Oliver Gee is an Aussie living in Paris. He is the host of The Earful Tower, a weekly podcast known to tens of thousands of Francophiles around the world. In his show, Oliver tries “to figure out France” with the help of various guests. Each episode provides a massive amount of insider info, from places to visit in Paris to aspects of French culture and language. Oliver recently invited us on his podcast to discuss some oddities of the French language, from small talk to funny expressions (j’ai la pêche !). It was really fun – we always enjoy giving practical tips to learn real-life French, the type of French you hear in news and entertainment videos on Ilini. After our podcast session, we wanted to continue the discussion by asking Oliver about his own French learning journey. Oliver, could you tell us what brought you to Paris and how long you have lived there? How was your French before you arrived? I came to Paris for a job as a journalist, and I’ve been here for about three-and-a-half years. When I arrived my spoken French was a 1 out of 10, and my understanding was maybe a 3 out of 10. How long did it take you to master French well enough to feel at ease in Paris? I’ve still not mastered French!! Let’s get that clear. But my French is easily good enough to get things done, pay taxes, solve a bank problem, get a refund for something. But if you put me in a room of French people discussing something very quickly, I will be the quiet one in the room. Yes, I speak Swedish better than I speak French. Which isn’t very handy in Paris, I must say. What is the most important thing you learned in French? That they don’t speak like they do in the text books. It’s crazy really, even when you learn at a school in Paris they teach you such formal stuff, then you go out on the street and people ask you where you bosse (slang for ‘where you work’). What is the most difficult thing you are still trying to learn in French? I’ve long given up on the subjunctive tense. But I’m always impressed when I hear another French learner use it. Sometimes I’m impressed when I hear a French person use it. What advice would you give to people learning French? Mimic everyone. All the time. Even if it feels weird. What I mean is, when you’re starting out, if you ask someone the time and they say “It’s a quarter past 12”, just repeat the sentence they said in the same way. It’s quite natural really, almost like you’re confirming them. Once you advance a little, remember the way people talk and use their phrases and language style for yourself after. Be a parrot and you’ll learn French even quicker. What resources do you use to improve your French – handbooks, videos, online courses…? Well, I don’t use books at all, but I’m signed up to a few online courses. The truth is that I’m not a very good practical student, I dropped out of my French class here in Paris because it was too boring. I do like online learning, even if I don’t realise I’m learning (like watching videos online). What kind of French videos do you enjoy watching? I’ve got a weird thing where I like listening to music in languages I don’t understand. I can write better when I have foreign lyrics playing in my earphones. I’m doing it now. So I’ve loved listening to French music on YouTube and gradually figuring out what they’re singing about. In fact, we talked about this when you came on my podcast – I was talking about listening to the Christine and the Queens song on Ilini. What are your future plans for The Earful Tower? The big thing I’m working on now is the Honeymoon season, where me and my soon-to-be-wife will spend six weeks riding a scooter around France in a big love heart shape. I really want to showcase France instead of just Paris on my show. Be sure to follow along – and let me know any places I should check out along the way! Visit The Earful Tower’s website, follow the show on Facebook, subscribe to the new Youtube channel and support the show on Patreon. Learn real-life French on ilini.com – watch French news and entertainment videos with interactive subtitles and games!